The Rainbow was God’s idea first, a symbol of promise, a sign of beauty to remind us that He is a covenant-keeping God. And so I was intrigued to receive and review the Rainbow Study Bible, Christian Standard Bible from B&H Publishing Group. Opening the pages, I see color throughout, twelve different hues, distinguishing portions of Scripture with the goal for the reader to better understand. “The design is according to a layman’s perspective to make teaching, studying, and categorizing as simple as possible. The colors divide thoughts into these categories: God, Salvation, Sin, Evil, Love, Family, Prophecy, History, Discipleship, Commandments, Faith, and Outreach. There are three pages giving details and explanation to help familiarize the reader with the topics. 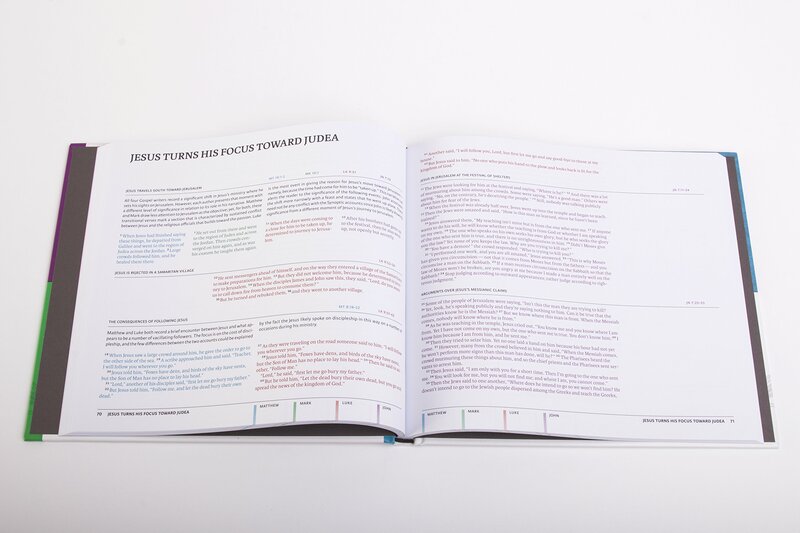 In addition, at the bottom of each page of Scripture is a color code making it easy to reference quickly. Additional study helps in the book are impressive: the books of the Bible in Biblical order as well as alphabetical order, multiple maps and illustrations, table of weights and measures, ancient versions of Biblical text, 365 popular Bible quotations for memorization and meditation, a one-year daily bible reading calendar, harmony of the gospels and more. From the 365 popular Bible quotations, I looked at the verse for today, and wouldn’t you know it. It was just what I needed to hear. So like the Holy Spirit to speak through the pages of God’s Word. The Rainbow Bible is hardcover with a ribbon page marker. Print is large enough that I don’t have to strain my baby blues. And of course, the book is beautiful with its colorful pages. My only concern is that the color hues are very close in shade, and sometimes it was challenging for me to decide into what category the verses actually fit. Someone who struggles with color-blindness would find it difficult to distinguish the colored categories. Overall, it is a very nice Bible, one that offers a lot of help to a Bible student. The color alone, makes it a pleasant reading experience. NOTE: I received a copy of CSB Rainbow Study Bible, provided by B&H Publishing Group, for an honest review. The book was free. The words are my very own. Let me dig right into this book review because sometimes something comes to me and I wonder where it has been all my life. As a long-time student of the Scriptures, I love the way this book brings continuity to the gospels. Matthew, Mark, Luke and John each have their own perspectives on the life and events of Jesus Christ, and their stories are written in their unique voices. I have often searched through my Bible to compare Mark’s version of a story with Matthew’s or John’s, thumbing through the pages to find and read each one. CSB Christ Chronological has brought the same stories together in one place. Here are Jesus’ stories side -by-side. In CSB Christ Chronological the gospels are color coded in the text and at the bottom of each page. A topic is introduced, noting corresponding chapter and verses from the gospels where it is recorded. Brief commentary precedes each section. During the seasons of Advent and Lent, I often read Jesus’ story in each of the gospels in order to see a more complete picture. I end up with four bookmarks in my Bible as I go from one writer to another. The CSB Christ Chronologicall has done this work for me. This book would make a wonderful addition to a Bible teacher’s library or to anyone who wants to know their Lord and Savior more. 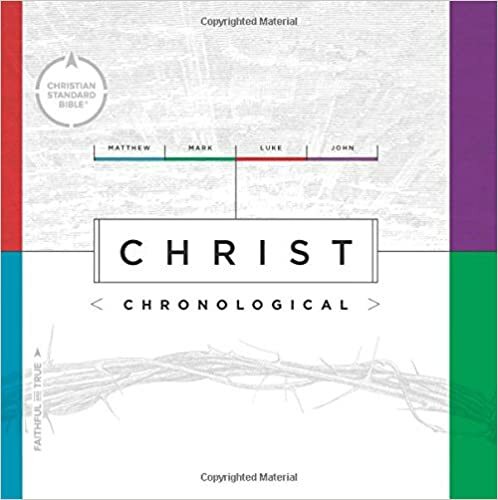 NOTE: I received a copy of CSB Christ Chronological provided by B&H Publishing, for an honest review. The book was free. The words are my very own. I credit my mother for instilling the discipline of daily devotions. I first remember her giving me Streams in the Desert, by Mrs. Charles Cowman, when I was just a girl. It was her way of teaching me the importance of daily time with Jesus. By now, my collection of devotional books has grown by stacks. The opportunity to review Awaken: 90 Days with the God Who Speaks, by Priscilla Shirer, was a no-brainer for me. I’ve participated in Ms. Shirer’s Bible studies a number of times and always enjoy the journey of her teaching. Awaken is her first devotional book, and it is a gem. Priscilla Shirer is a Bible scholar who writes with the authority of one who knows the Author and His works. Awaken affirms that God wants to speak to us as individuals. Without dated pages, one can begin this book anytime and pick it up again when the schedule permits. No guilt if you miss a day. Just continue to the next entry. But don’t wait too long to read another daily devotional because this is good stuff. For each day Ms. Shirer gives a short Bible illustration, coupled with her own experiences, then re-enforces both with Scripture verses. Finally, she asks a question to help the reader make application to his/her life. The questions are thoughtful and thought-provoking. A blank page gives plenty of room to journal one’s thoughts. It is in the writing that I often understand more clearly what I’ve read and how it pertains to and connects with me. Thus, I am able to hear from the God who speaks. Because He does want to speak to me. A day without the Word and listening for God’s voice is not the way to start a good day. Just sayin’. NOTE: I received a copy of Awaken: 90 Days with the God Who Speaks, provided by B&H Publishing, for an honest review. The book was free. The words are my very own. I’ve got quite a collection of Bibles. Growing up, I was often on the receiving end of such gifts. As an adult, I’ve wanted study Bibles and different translations so I could understand better. While it is the trend to read any available version of Scripture online via laptops, tablets or smart phones, I still prefer to hold the book in my hands, turn the thin pages, underline verses and make notes in the margins. Call me old-fashioned. So I was delighted to receive the Christian Standard Bible from B&H Publishing Company for review. The dual shaded brown leathertouch book is thinline and light weight, a just-right size for purse or carry case. The cover has a soft feel. Opening the book and turning its delicate, golden-edged pages is a pleasing sensory experience. I’ve not had a Bible with cut-in tabs showing the books for quickly locating them, and I must say I am finding that very helpful, even though I learned the books of the Bible when I was a child. The Old Testament order can still be tricky, and I often sing a song that helps me with the New Testament order of books. There is an “Introduction to the Christian Standard Bible” near the front explaining how this particular version came about. This is always important to me. I want to know that every effort was made to be as accurate as possible in translating the Scriptures to a readable format. And I am comfortable that the CSB is just that. This is a lovely book to look at and hold. It will take its place among the varied translations and paraphrases I already have on shelves. I want to be a good student, to search out on my own and not just swallow what someone tells me. The more I am able to understand what God is trying to say, the more I get to know who He is. And the more I know who God is, the more I love and trust Him. NOTE: I received a copy of the Holman Christan Standard Bible, provided by B&H Publishing, for an honest review. The book was free. The words are my very own.